Transportation prices, especially taxi fares, vary dramatically around the world. In an effort to find some method in the confusion, here is a list 20 cities ranked on the basis of highest and lowest taxi fare a three-kilometre ride would cost. The fares are in price ranges, instead of average price, because many cities have different prices with each company or different price structures at night or on weekends. * The figure (cost) given first (the one to the left) reflects little to no waiting in traffic, while the figure to the right reflects high-traffic situations plus night or weekend surcharges. Image: Taxi fare varies across the world. Public transport is extremely popular in Zurich and residents use public transport in large numbers. About 70 per cent of the visitors to the city use the tram or bus and about half of the journeys within the municipality take place on public transport. 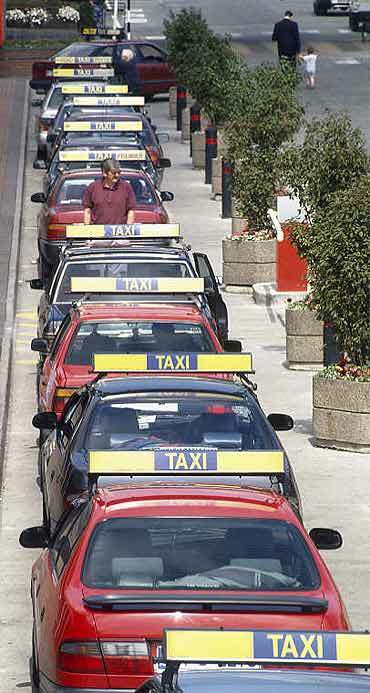 Image: Zurich has the highest taxi fares in the world. Oslo, the largest city in Norway, has been listed as one of the most expensive cities in the world along with such other major global cities as Zurich, Geneva, Copenhagen, Paris and Tokyo. Oslo is the cultural, scientific, economic and governmental centre of Norway. The city is also a hub of Norwegian trade, banking, industry and shipping. It is an important centre for maritime industries and maritime trade in Europe. Image: Oslo is one of the most expensive cities in the world. Monaco is the second smallest country (by size) in the world; only the Vatican City is smaller. Monaco is also the world's second smallest monarchy, and one of the most densely populated countries in the world. Monaco is often regarded as a tax haven, and many of its inhabitants are wealthy and from foreign countries, although they are not a majority. 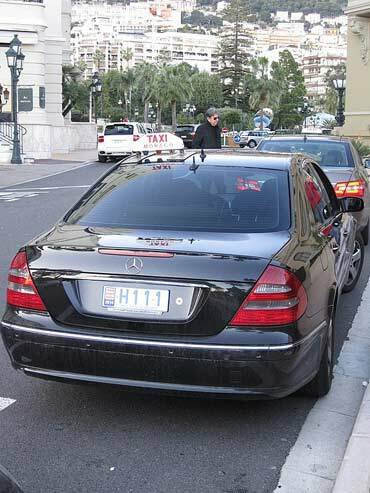 Image: Monaco is regarded as a tax haven. Transportation within the city of Amsterdam is characterized by bicycles and public transportation. Large freeways only exist around the city. Navigating by car through the city centre is discouraged, with the government sponsoring initiatives to reduce car usage. 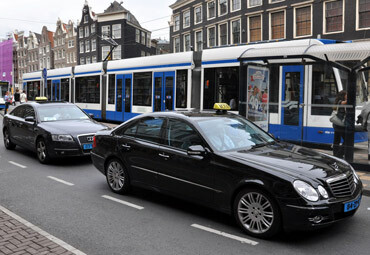 Image: Dutch government wants to discourage car use. Public transport in Helsinki consists of bus, tram, metro, train and ferry services. The system is managed by Helsinki Region Transport. The diverse public transport system of Helsinki region consists of trams, suburban metro railways, the subway, bus lines and two ferry lines. Today, Helsinki is the only city in Finland to have trams or subway trains. Image: Helsinki's transport system is diverse. Nice is a popular destination for vacationers both young and old, with something to offer nearly everyone. It is well known for the beautiful view on the Promenade des Anglais, its famous waterfront, and is an ethnically diverse port city. Image: Nice is an ethnically diverse port city. Public transport in Stockholm consists of bus, metro, regional/suburban rail, light rail, tram and archipelago boat operation in Stockholm County. The bus and rail is organized by Greater Stockholm Public Transport, which is owned by the Stockholm County Council. The operation and maintenance of the public transport systems are delegated by SL to several contractors. The airport rapid public transport systems are handled separately though. Image: Stockholm is at number seven. Taxis in Tokyo also serve a similar role to buses, supplementing the rail system, especially after midnight when most rail lines cease to operate. People moving around the city on business often chose taxis for convenience, as do people setting out in small groups. Most companies tend to raise fares by 20 per cent between 22.00-5.00, but some have kept fares low to compete in a crowded market. Image: Taxis supplement the rail system in Tokyo. There are a number of modes of public transport in the Greater Dublin area run by a number of transport operators, most of them state or quasi-state entities. Public transport in Dublin is overseen by the Dublin Transportation Office. It has undergone expansion in recent years. Image: Transportation in Dublin has undergone transformation. Munich is the most expensive city in Germany. The best way to travel around Munich is the Tram (streetcar), bus, S-Bahn (metro railway) and U-Bahn (subway) system. Image: Munich is the most expensive city in Germany. Red and white normal taxis are reasonably priced and probably the best way to get around, at least outside the congested peak hours. Bright blue executive taxis charge a bit more by the kilometre. There are also various small surcharges for radio call, baggage, etc. 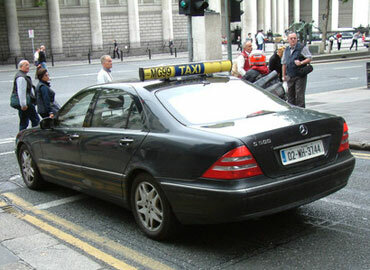 While all taxis are supposed to use the metre, drivers may be reluctant to use it and will often demand a fixed price. This is especially so when demand exceeds supply, such as during the rush hour or when it rains, when the price demanded can be up to 2-3 times the metre price. Image: Kuala Lumpur has three types of taxis. 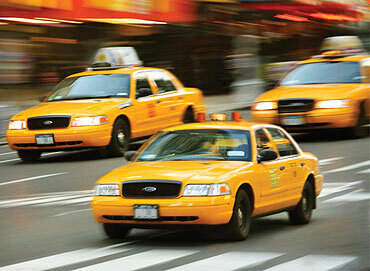 There are more than 250,000 registered cabs in the city and they are one of the most efficient ways to get around. The prices are low. The night rates, supposedly between 11 pm and 6 pm are about 20 per cent higher. Some taxis "adjust" their metres to run more quickly, but in general, cab fare is cheap, and it's usually easy to find a taxi. At night, and in areas where there are few taxis, cab drivers will often not use the metre, but rather quote a price. This price will often be high. Image: Taxis are the best way to get around in Mexico City. 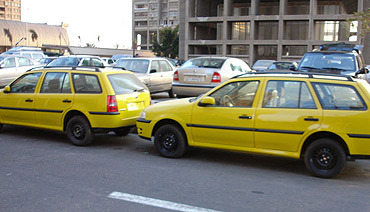 Petits taxis are the best way to move around Fez, they are metre operated and can be found parked all over the city. 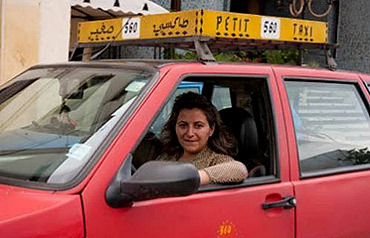 Image: A woman taxi driver in Fez. Because of the size of the island, it is not difficult to get around Bali by various modes of transportation. The traditional types of transportation to the high class limousine are available for tourist to choose. 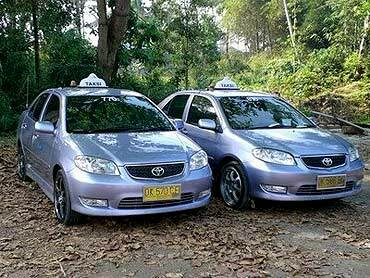 Taxi is the most efficient and convenience transportation in the island. Either chartered or metered one, they are everywhere and quite inexpensive compared to some other countries. Image: It is easy to get around in Bali. Panama has a form of public transportation consisting of colourful painted buses colloquially known as diablo rojo. A diablo rojo is usually "customized" or painted with bright colours, usually depicting famous actors, politicians or singers. It is popular for bus drivers to customize the interior and exterior of their diablo rojo. 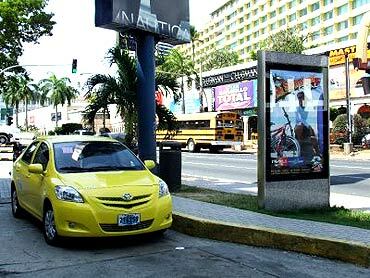 Image: Panama City has one of the cheapest taxis. Manila, being a major city, affords various transportation options. Famous of all these forms of transportation is the public jeepney, which has been in use since the years immediately after World War II. Buses, air-conditioned metered taxi and Tamaraw FX mini-vans are also popular forms of transportation. Image: Taxis are popular in Manila. 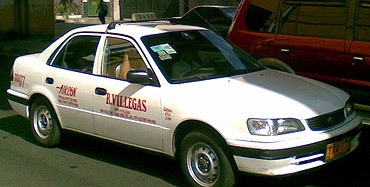 Although taxis are not metred, they are the easiest way to get around La Paz. 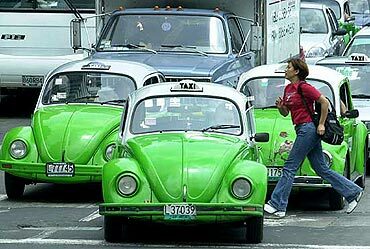 Image: Taxis are not metred in La Paz. 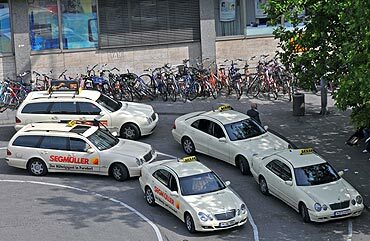 Solid-White Taxis: These are modern sedans equipped with metres that are usually used, AC, and run on natural gas. 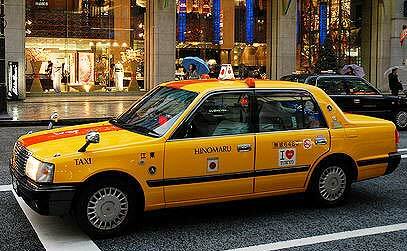 Bright Yellow Taxis: Typically available by reservation only, but sometimes try to pick up fares while en-route. Older Black-and-white taxis: These are the most common. However, communication can be difficult as these usually have the oldest of drivers, and the metres are extremely outdated and thus not normally used. 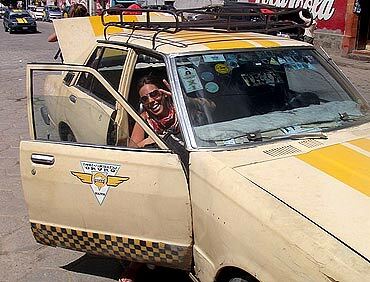 Image: Taxis are cheap in Cairo. The Taxis arrived in Mumbai in 1911 to complement horse wagons. The black and yellow Premier taxis in Mumbai are integral part of the city's heritage and have been depicted in numerous Bollywood movies. The current regular taxi fare in Mumbai is Rs 16 for the first 1.6 km and then Rs 10 per every subsequent km. The taxi bill goes up between midnight and 5.00 a.m. with a 25 per cent additional fare for the journey. These metered taxis ply throughout Mumbai and have monopoly from Bandra to Churchgate on the Western line and Sion to Chatrapati Shivaji Terminus on the Central line. Beyond Sion and Bandra auto rickshaws are not allowed and one has to hire a taxi. However, between Sion to Thane and Bandra to Bhayandar, taxis and autorickshaws ply. A mechanical metre decides the fare and is proportional to the distance travelled. 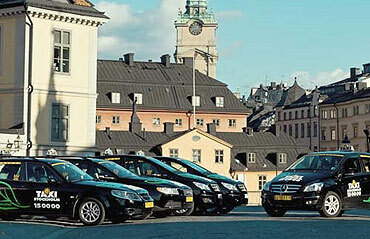 Recently Radio cab services have been introduced by some private companies. These taxis are new air-conditioned cars fitted with GPS and electronic metres. Image: Taxis arrived in Mumbai in 1911. In New Delhi, all taxis run only on compressed natural gas (CNG). The taxi fare in Delhi is Rs 20 for the first km and then Rs 11 per every subsequent km. An additonal 25 per cent fare is to be paid for travel between 11.00 p.m. and 5.00 a.m. 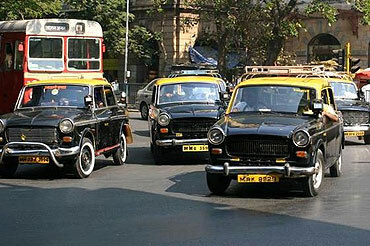 Most of the traditional taxis in India are either Premier Padmini or Hindustan Ambassador cars. In recent years, cars such as Maruti Esteem, Maruti Omni, Mahindra Logan, Tata Indica and Tata Indigo have become fairly popular among taxi operators. Though easily available, taxis are not an integral part of New Delhi public transport. The Union tourism ministry and various private owners operate most taxis. 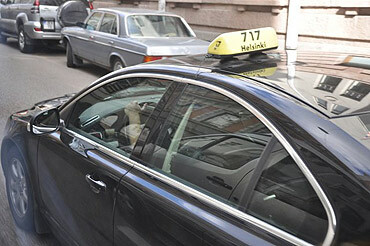 The tourism ministry grants private companies permits to operate taxis. 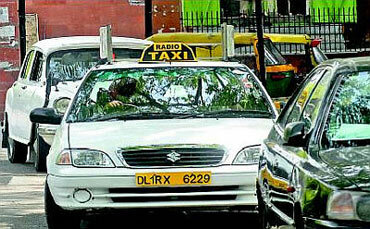 Recently, Radio Taxis have started to gain ground in New Delhi. Brands such as Mega Cabs, EasyCabs, etc, provide the on-call radio taxi service, which is slightly more expensive than conventional Black and Yellow taxis. Image: Taxis in New Delhi run on CNG.